Custom Creekside estate with detached Casita perched on the banks of Oak Creek surrounded by towering Sycamore and Cottonwood trees. Sprawling single level home with highest quality finishes that opens onto a large covered outdoor living room and kitchen perfect to enjoy the four mild seasons and sounds of the rippling waters below. Cooks kitchen is centered on the butcher block island and features granite countertops, Wolf and Sub Zero stainless appliances and opens onto the outdoor kitchen with Dacor grill and local river rock fireplace. Three bedroom split floorplan feels cozy due to cherry wood flooring throughout, high rough-sawn beamed ceilings and plastered walls. Detached casita is perfect for guests - and both have access to rear patio with Pebble-Tek pool on the Creek! 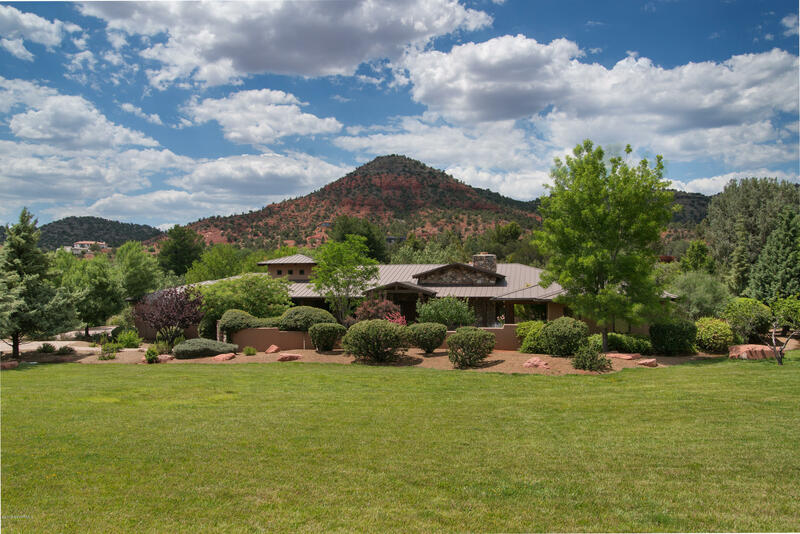 © Sedona Verde Valley Association of Realtors, Inc., 2019. Information deemed to be reliable but not guaranteed. The data relating to real estate for sale on this website comes in part from the Broker Reciprocity(sm) Program. Real estate listings held by brokerage firms other than Beaver Creek Realty are marked with the BR logo and detailed information about them includes the name of the listing brokers. Only residential real estate listings are shown from the IDX database. IDX information is provided exclusively for consumers' personal, non-commercial use and may not be used for any other purpose than to identify prospective properties consumers may be interested in purchasing. Information last updated on 2019-04-23.